Media is done and weigh-ins are over, and now UFC 222: Cyborg vs. Kunitskaya is just hours away. Below is a new UFC.com Pay Per View special feature where our writers face off and discuss the big fights set for Saturday night. Cris Cyborg makes a quick turnaround from her December win over Holly Holm and faces Invicta FC champ Yana Kunitskaya. And though I usually don’t like having these conversations while a fighter is active (I’m lying, I do), it’s probably a good time to start wondering whether the UFC women’s featherweight champion is the greatest female MMA fighter of all-time. I admit, I was on the fence about making the call on Cyborg as the best ever before she beat Holm, as I still hold Ronda Rousey’s run from her debut through the Bethe Correia fight to the greatest we’ve seen from the ladies. But just like Mike Tyson’s prime run didn’t make him the greatest heavyweight boxer of all-time (I go Muhammad Ali and Joe Louis as 1-2, if you were wondering), Rousey’s reign can’t earn her the top spot in this discussion. So what makes Cyborg the best? Simply put, continued and consistent dominance. Unbeaten for over 12 years, Cyborg has run through any and all comers. And while her level of competition has been spotty at times before making it to the UFC, in her back-to-back wins over world-class foes Tonya Evinger and Holm, she’s proven that no matter who is in front of her, she will find a way to win. And she’s only 32. Along with the standard “Can anyone beat Cyborg?” intrigue that comes with each of the featherweight champion’s fights, the reason I’m really interested in the main event is because Cyborg is making the quickest turnaround of her career and the unknowns that represents are intoxicating to me. The possibility of Cyborg being able to get back to full strength and turn back another quality opponent basically two months after her toughest fight in years could potentially mean we see more of the Brazilian wrecking machine in 2018, but what if hustling back into the cage like this is a mistake? Kunitskaya is a game and savvy opponent and if Cyborg slips up, she’ll be ready to pounce. 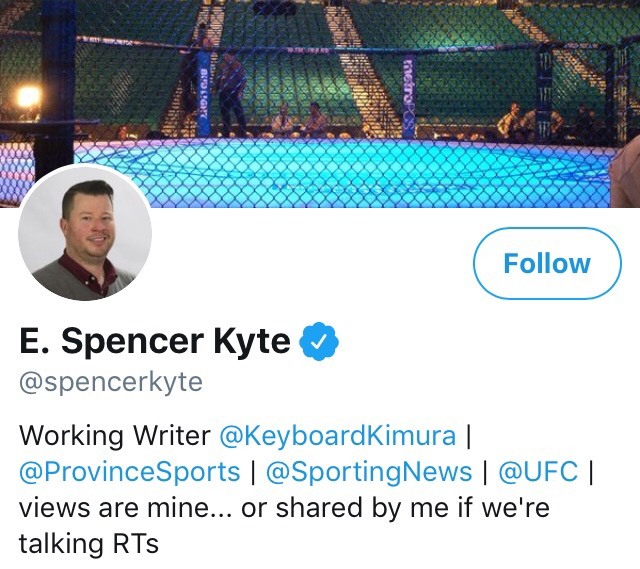 It's no secret that Yana Kunitskaya is fighting an up hill battle against the fighter I do believe is the greatest women's mixed martial artist of all time in Cris Cyborg. Kunitskaya is a solid prospect, who has gone to battle with Tonya Evinger twice in the past, but in her UFC debut to go up against a wrecking machine like Cyborg is a tall order. Really that's a tall order for anybody with a full training camp and 20 UFC fights under their belt. Cyborg is just that good. Perhaps the biggest question will be how Cyborg performs against an opponent everybody expects her to beat. She has dominated lesser opposition in the past so can Cyborg do it again? Is there a chance that Cyborg sees a potentially huge legacy fight in front of her against women's bantamweight champion Amanda Nunes and that might pull her focus away from Kunitskaya? It doesn't seem likely but those are all factors that have to be considered in this main event showdown. There is no question after Cyborg’s performance against Holm that she now stands atop the mountain as greatest female MMA fighter in history. I don’t think there was much a question before UFC 219. Cyborg’s destruction of Gina Carano in her prime may be one of the most undervalued “big wins” for any fighter in the all-time great discussion. I expect the dominance to continue for Cyborg at UFC 222 when she takes on an intriguing foe in Kunitskaya. I’m very interested in what Team Jackson/Wink can come up with in terms of a game plan on the heels of Kunitskaya’s teammate Holm’s battle with Cyborg. Even with the tips from Holm, I don’t see Kunitskaya being able to handle the power, speed and technique of the champion. 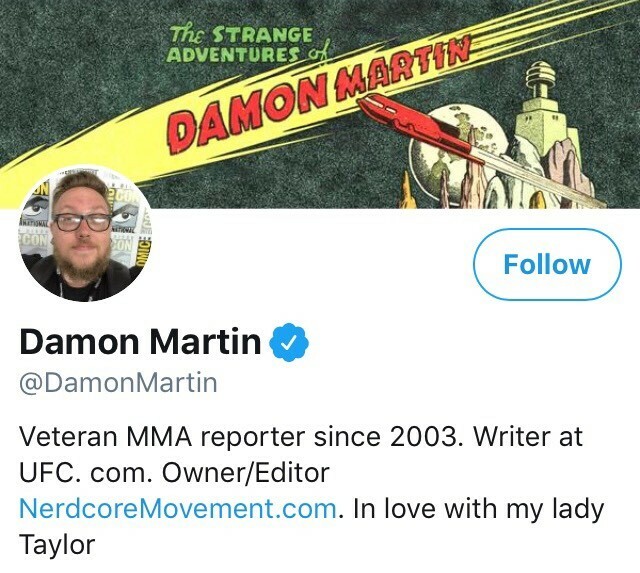 “Foxy” likes to utilize the clinch in her fights and trying to get close enough to employ that strategy against Cyborg is going to put her in the danger zone. Look for Cyborg to get back to her finishing ways in Las Vegas Saturday night. I do agree with everyone else here (even Parrino, painfully) about the sentiments surrounding Yana Kunitskaya in the main event. It's almost a challenge anymore to articulate how great Cris Cyborg is, and it's difficult for anyone's imagination to conjure up what beating her would look like. Holly Holm gave a very game effort, and still there was never any doubt to whom that fight belonged. The quick turnaround for Cyborg could be the weakness in the Death Star that the rebels will try to exploit, or she gets caught Clubber Lang-style riding the wave of her success à la Rocky III, but there's very little that seems plausible about either of those scenarios, and I think Cyborg easily continues her reign. 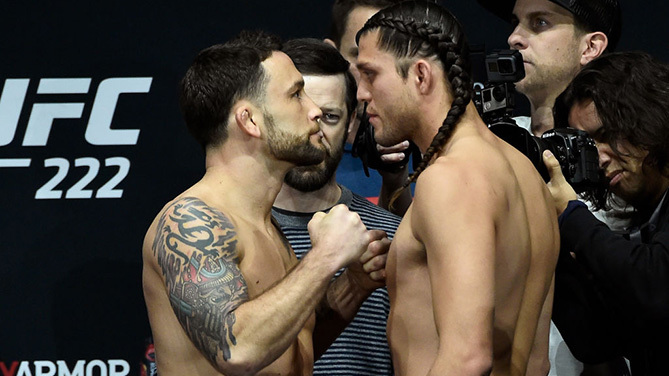 A lot of interesting fights on this weekend’s UFC 222 card, and for my money, the most interesting pits Frankie Edgar against Brian Ortega with a shot at Max Holloway’s featherweight title on the line. Now let’s get this out of the way. I have an east coast bias when it comes to “The Answer.” I’ve covered him since his UFC debut over 11 years ago, he’s one of the classiest gents in the game, a true pro and, oh yeah, he can fight a little bit too. That’s not a knock against Ortega, who is a great interview and a fun fighter to watch, but full disclosure is always good. So anyway, on to the fight, and I’m intrigued by this one for the same reason I was intrigued by Edgar’s fight against Yair Rodriguez. Can the young rising star make that jump to the next level against a veteran who has seen and done it all? Rodriguez didn’t get the job done. Will Ortega be able to? “T-City” is scary on the ground and he’s willing to throw hands with anyone. But a couple things stick out to me about him. As a true martial artist, he wants to test himself in any and all areas and, in doing so, he’s made some fights tougher than they should have been, in my opinion. And he’s admitted as much. That won’t work out well against a fighter like Edgar. And what happens if Ortega gets Edgar in trouble and the former lightweight champ – who has never been stopped – keeps coming? That’s what I’ll be looking for this Saturday. 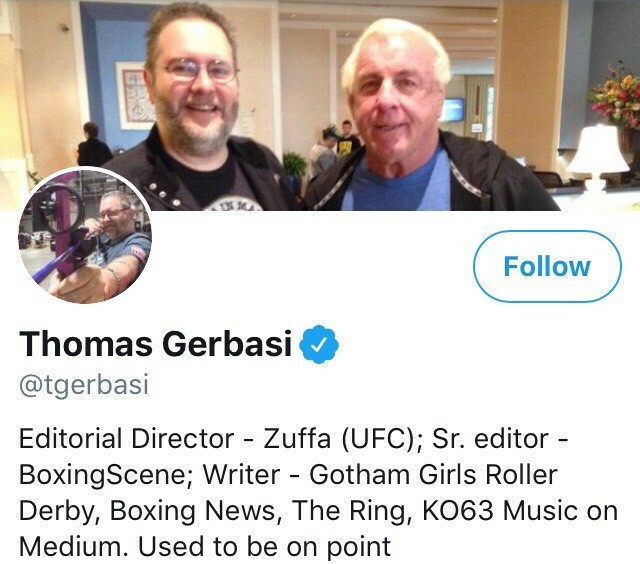 As always, TG is on-point about Edgar being one of the classiest guys in the game and a heck of a fighter, not to mention what makes his fight with Ortega so intriguing. While the comparison to Edgar’s clash with Rodriguez is obvious, I feel like it sells Ortega a little short. Rodriguez got booked with Edgar after beating the ghost of B.J. Penn; Ortega choked out Cub Swanson and for the first time in a couple fights, he got it done before the third round and didn’t make things more difficult on himself. The thing that really interests me about this fight is that while Edgar was able to dominate Rodriguez by putting him on his back, Ortega is happy to land there, as he boasts an outstanding guard and doesn’t allow guys to get comfortable on top. Will that work against a veteran technician like Edgar, who mixes things up well and is happy to dump guys on the canvas over and over again without really messing around on the mat? That’s why we’re all tuning in, right? It's been almost exactly a decade since Frankie Edgar last lost a non-title fight and that was the first defeat of his UFC career when he fell to Gray Maynard back in 2008. The only other defeats on his record have come in championship fights because Edgar has faced the best of the best throughout his tenure with the UFC, which is why he keeps getting back to those title opportunities. Edgar has knocked off veterans and prospects alike, but does Brian Ortega have the secret sauce to finally knock him off his perch as the No. 1 contender at 145 pounds? While Ortega has been undefeated through his run in the UFC, he's definitely made it tougher than it should have been in some cases. He's pulled off late submissions in several fights with the scorecards still up in the air if the judges got involved. That is a worrisome trend when going up against someone as tough and durable as Edgar. Edgar has never been finished in a fight and he just so happens to train with a world class bunch of grapplers and coaches working under former UFC fighter Ricardo Almeida as well as his teacher Renzo Gracie. Now time runs out on every fighter at one point or another but there's no signs that Edgar is slowing down. That said, Ortega does have the benefit of this only being a three round fight where Edgar seems almost built to go 25 minutes every time he steps into the Octagon. Ortega has to get a fast start and cannot allow Edgar to dictate the pace or he's going to be in trouble from the first minute until the last. Initially I liked Brian Ortega a ton in this fight. His size and well-rounded skillset had me leaning toward picking the undefeated super prospect in the biggest spot of his career. Then I stopped for a bit and reminded myself of the greatness of Frankie Edgar. “The Answer” is consistently taken for granted and his accomplishments in two weight divisions make him a sure fire future Hall of Famer and a real threat to capture a championship in a second weight class – even at 36 years old. I doubted Edgar when the hype train surrounding Yair Rodriguez was at its peak, but I’m not willing to do it again. Edgar’s speed and wrestling are going to present a problem for Ortega, who likes to get hit a bit in his fights as he tries to settle into the comfort zone. He said he was a bit star struck earlier in his career when he faced Clay Guida and if those feelings reservice against Edgar, it’s going to be a long night for the talented up-and-comer. At 145 pounds nobody has figured out a way to defeat Edgar except legend Jose Aldo. And that fact is at the heart of the discussion: to beat Edgar a fighter has to figure him out – find the answer. Ortega won’t be faster and Edgar will be more polished in the striking exchanges. “T-City” will be dealing with the bright lights and a perplexing puzzle of skill and experience that I don’t know if he’s ready to handle. I think his best chance in this fight is to wind up on his back and attack Edgar with some of his patented triangles and arm bars. If the fight stays standing, I expect Edgar to school the young rising star. Edgar by decision. 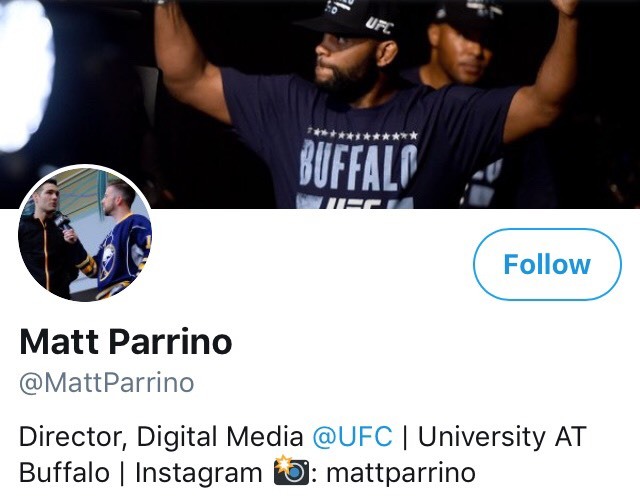 When Parrino said that he initially like Brian Ortega in this fight, I started to get a strange, worried feeling that I might agree with him on something, but things snapped back into focus when he picked Frankie Edgar. Don't get me wrong, I understand it's a fool's errand to pick against Edgar, and if this were nearly any other matchup, I wouldn't. But at least Aldo had an answer for "The Answer" and I'm asking, who has had an answer for Ortega...ever? Will he finally earn your respect with a win here? 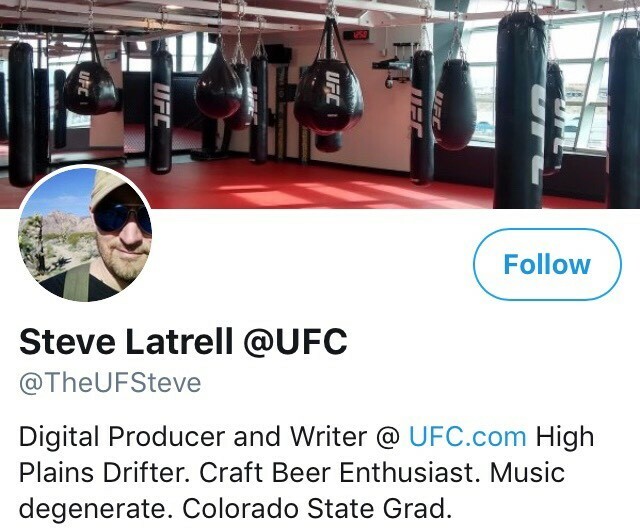 Is this that weird moment where i have to remind everyone that not only is he undefeated, but he's never gone the distance in the UFC despite only appearing in three-round fights? As has been alluded to here, being able to take some damage while he searches for his opening is what makes Ortega so dangerous. I spoke to him a few weeks ago and asked him point blank if eating punches was part of his strategy or a coincidence, and he was really forthright. "That's my style," he said, "A lot of people don't want to get hit. It's a fight. We're gonna get hit. You've gotta take one in order to give one.” Lord knows he's going to need that mindset against Frankie. "I'll pressure you, I'll bang with you," he continued, "and if I feel like it's not working, if it's too much of a slugfest, then I'll get technical." It's the "then" that's operative in that statement. His opponents get lulled into thinking they're going to outpunch this guy, and then boom, out comes the triangle. Out comes the guillotine. He also claims that the longer a fight goes on, the faster and sharper he gets. Re-watching his fight library, I see no evidence that he's incorrect about that, and such a skill will behoove him against Edgar's cardio. The icing is the age, size and reach advantage. I can't shake the feeling that Ortega is on the verge of having his moment, and Saturday he sets up his inevitable meeting with Max Holloway.